Innovations in the field of robotics – from driverless cars to delivery drones – are bridging the gap between science fiction and reality. Be it medicine or military, robots are prevalent in almost every industry today and are no longer limited to the manufacturing sector. While robot-assisted surgeries continue to enhance surgical outcomes, robots are also transforming business processes. With the increasing use of artificial intelligence and its integration into robotics, intelligent robots with cognitive abilities are helping companies to analyze and process large amounts of data in a short span of time. Another robotic advancement that’s rising in popularity is the use of collaborative robots (co-bots) in the production sector. Instead of replacing the employees in an industry, co-bots work in tandem with their human counterparts to help optimize productivity and elevate the efficiency of a process. Furthermore, drones, in addition to surveillance, are also starting to assist in transporting materials from one area to the other in a manufacturing company, thus enabling employees to devote their time to more meaningful tasks. Companies are also seen inclining towards robot-as-a-service, on rental or temporary basis, to make the most out of a robot’s highly specialized functionality. At the same time, robotics remains highly focused on cutting down costs and making robots more customizable. In an effort to help companies optimize their business processes, a panel of prominent CEOs, CIOs, VCs, analysts, along with the CIOReview editorial board has assessed scores of Robotics solution providers and picked out a list of prime choices. 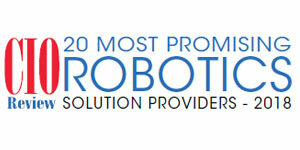 We present to you CIO Review’s Top 20 Most Promising Robotics Solution Providers - 2018.